Physical description: Average adult Alligators range from 8.2 feet for females to 11.2 feet for males and can weigh over a ton. They have a long, rounded, shovel shaped snout with nostrils at the end which allow them to breath while their body is under water. Their bodies are long and lizard-like with a thck, muscular tail. Early History: Crocodilians have existed for more than 150 million years, far surpassing their dinosaur and flying reptilian cousins. Members of this family were successful predators long before mammals began their rule. General Information: Alligators do not truely hibernate, but they do undergo periods of dormancy in cold weather. They are known to search out caves in the banks of waterways and use them as dens. Females usually have a small range, while males occupy areas of greater than two miles. Both sexes become more active and extend their territory during the breeding months of April and May. 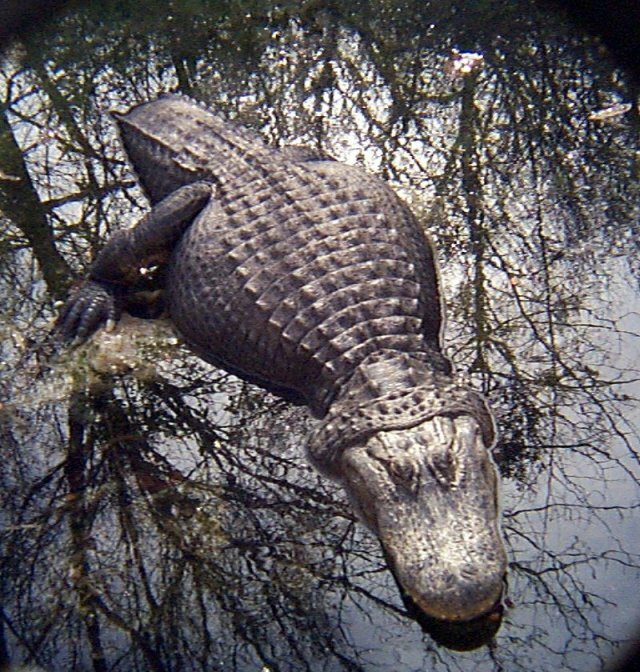 Special Anatomical, Physiological, or Behavioral Adaptations: Modern Alligators have many adaptations that make them well suited to their wetland envirnment. Their eyes, ears, and nose are positioned to peek out just above the waterline so they can locate prey without being easily identified. Their eyes and nostrils close by reflex when the animal goes underwater, and they have a transparent third eyelid, or nictitating membrane, that covers the eye as the animal moves through the water. Reproduction: Sexual maturity is based upon the size of the Alligator. Both sexes are usually considered mature when they reach about six feet long. In the wild that is about 10-12 years old. In captivity, though, they can reach maturity much more quickly. After mating, females construct nests of underbrush. They lay 35-50 eggs. There is a 65 day incubation period during which time the female stays close by the nest. The female knows the babies are ready to hatch when they begin making high-pitched grunting sounds. At this point she uncovers the nest for the babies to get out. Comments About the Alligators of the Fort Worth Zoo: The Alligator in the Fort Worth Zoo seems large and lethergic. 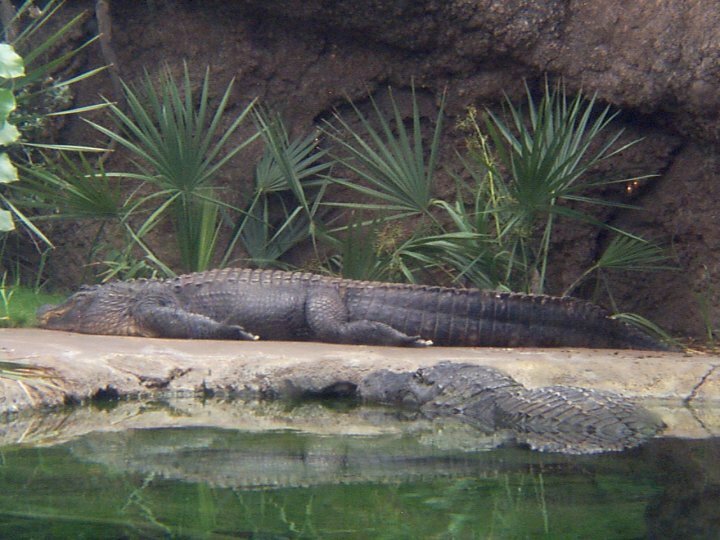 Alligators usually prefer to hunt at night, so during zoo hours they are resting. Personal Observations: The Alligator in the Fort Worth Zoo sits so still you might think he is a statue. In fact, the crocodialian keeper says that they often have to clean out the pond because people think it is a wishing well and throw money in. Update: In its new home in the Texas Wild! swamps exhibit, the American alligator is no longer disturbed by coin-tossing. In the new exhibit, the alligator shares its swamp with a large Alligator Snapping Turtle. 3) Lance, Valentine A. "Reproductive Cycle of the American Alligator" American Zoologist. Vol. 29 no.3 '89 p.999-1018. 1989. 4) Delany, Michael F., Abercrombie, C.L. 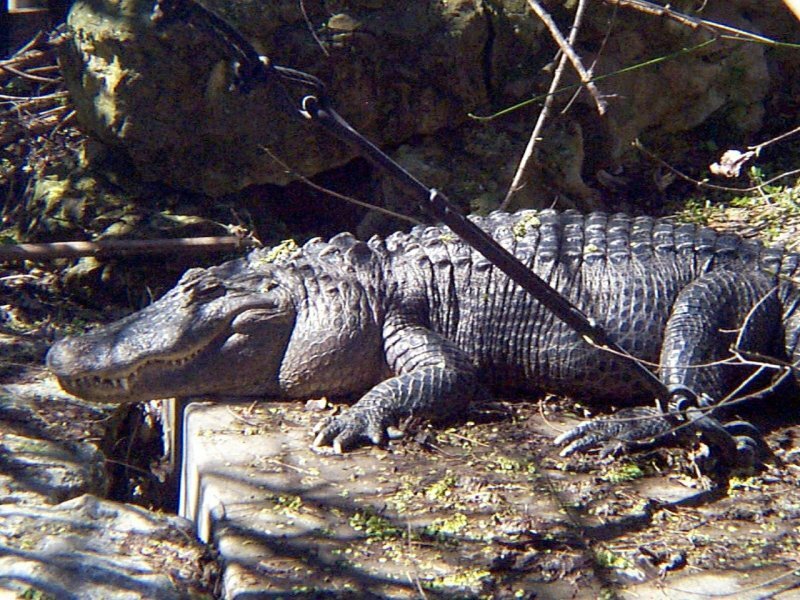 "American Alligator Food Habits in North Central Florida." The Journal of Wildlife Management. Vol.50 April86 p.348-353 1986.